Great Expectations (1861) is the thirteenth novel by Charles Dickens and his penultimate completed novel: it depicts the personal growth and development of an orphan nicknamed Pip. The novel is set in Kent and London in the early to mid-19th century and is full of extreme imagery — poverty, prison ships and chains, and fights to the death and has a colourful cast of characters who have entered popular culture. These include the eccentric Miss Havisham, the beautiful but cold Estella, and Joe, the unsophisticated and kind blacksmith. Its themes include wealth and poverty, love and rejection, and the eventual triumph of good over evil. 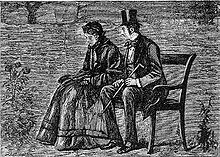 The novel was first published as a serial in Dickens's weekly periodical All the Year Round, from 1 December 1860 to August 1861. In October 1861, Chapman and Hall published the complete novel in three volumes. Now, I ain't alone, as you may think I am. I give Pirrip as my father's family name, on the authority of his tombstone and my sister, — Mrs. Joe Gargery, who married the blacksmith. As I never saw my father or my mother, and never saw any likeness of either of them (for their days were long before the days of photographs), my first fancies regarding what they were like were unreasonably derived from their tombstones. The shape of the letters on my father's, gave me an odd idea that he was a square, stout, dark man, with curly black hair. From the character and turn of the inscription, "Also Georgiana Wife of the Above," I drew a childish conclusion that my mother was freckled and sickly. Now, I ain't alone, as you may think I am. There's a young man hid with me, in comparison with which young man I am a angel. That young man hears the words I speak. That young man has a secret way pecooliar to himself of getting at a boy, and at his heart, and at his liver. It is in wain for a boy to attempt to hide himself from that young man. A boy may lock his door, may be warm in bed, may tuck himself up, may draw the clothes over his head, may think himself comfortable and safe, but that young man will softly creep and creep his way to him and tear him open. I had been to see Macbeth at the theatre a night or two before and she reminded me of the faces rising out of the witches' cauldron. "But you said to me," returned Estella, very earnestly, "'God bless you, God forgive you!' And if you could say that to me then, you will not hesitate to say that to me now,— now, when suffering has been stronger than all other teaching, and has taught me to understand what your heart used to be. I have been bent and broken, but — I hope — into a better shape. Be as considerate and good to me as you were, and tell me we are friends." This page was last edited on 8 February 2019, at 08:04.